My family had a reunion in Florida (a few days after my last post) and it was spectacular! My daughters who live in Dallas and Washington D.C. joined us, my sister and her family from Pittsburgh and relatives from as far away as California descended upon Jacksonville, FL for a wonderful family reunion. A couple of days after returning home, I set out again for Salt Lake City to attend the Log Home & Timberframe Expo sponsored by Log Homes Illustrated. 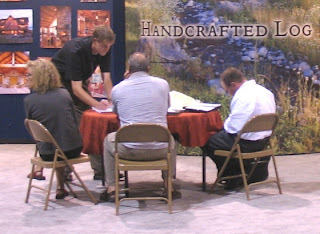 While roaming the show floor, I spent a great deal of time observing and listening… I was curious to hear what people were asking the vendors – what seemed to be important to these prospective home buyers. I wish I could tell you that I have solved the mystery of the ages and discovered that ONE critical question that is on everyone’s mind, but it was not to be. However, I did have a revelation… it dawned on me how important these shows are for prospective log home buyers. The questions I overheard probably would not surprise you – and that was the surprise. People were doing exactly what people do when contemplating such a major expenditure. They were gathering information, asking questions, comparing products, seeking advice and learning everything they could about log and timberframe homes. They were utilizing the show in the manner in which it was intended. They were learning! If you are considering such a purchase and if you have never attended such an exposition, you must make it a point to do so. You can learn more in one afternoon that you could in weeks of phone calls and email exchanges with manufacturers and builders. As the editor of the Log Cabin Directory, my goal has been to provide information to help you make an informed decision, and offer links to as many resources as possible. I believe that our directory is the best “starting point” for anyone looking for log home information. It is a good place to learn about the products, our industry and formulate the questions you would have of any supplier or contractor. The next recommendation I would make is that you take this knowledge and attend a log home show. To give you an idea of what awaits you, I posted a number of photos and commentary on our site aptly titled, “What to expect at a log and timber home show”.